Winner in three of four starts in 2008, including a seven length score in the Send More Money Stakes at Presque Isle Downs and a four length victory in the Maryland Million Nursery Stakes, earning $165,750. Winner of the Blue Mountain Futurity at Penn National and the Eavesdrop Stakes at Philadelphia Park. Glorious Smile won two of her four starts with two seconds, earning $113,165. Winner of three straight, including the Stanton Stakes at Delaware Park, followed by thirds in the G2 Hall of Fame Stakes at Saratoga and the G3 Bryan Station Stakes at Keenland, earning $121,500. Winner of four of her eight starts including a six length victory in the Cozy Lace Stakes at Presque Isle Downs and a second place finish in the Wonders Delight Stakes at Penn National, finishing with $201,690 in earnings. Dk. b. g., 2004, Patton – Yanni’s Girl, by Commadore C.
Winner of six of fourteen starts in 2008, including four stakes victories the Presidentialaffair and Leematt Stakes at Presque Isle, and the Lyman and Yankee Affair at Philadelphia Park, earning $296,160. 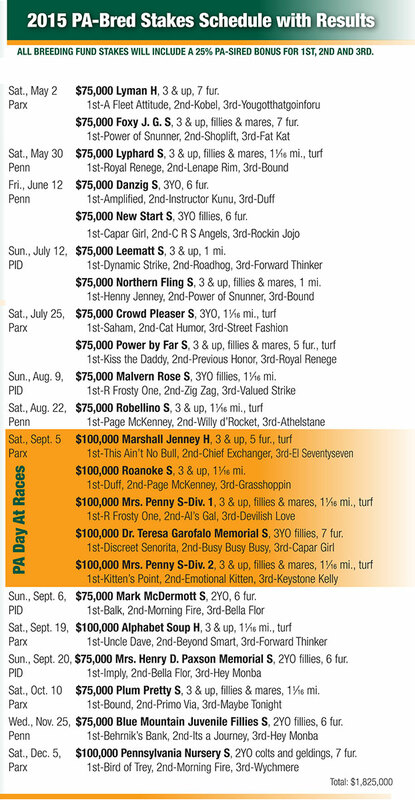 Winner of four stakes in seven starts, the Foxy J. G., the Langhorne, and the Ambassador of Luck Handicap, all at Philadelphia Park, and the Daylilly Stakes at Penn National earning $240,340. Winner of the Al Rashidiya (UAE G3) and the Jebel Hatta Nayef (UAE G2) at Nad al Sheba Racecourse in Dubai, and seconds in the Amethyst Stakes-G3 and the Meld Stakes-G3 in Ireland, with earnings of $411,341. His one winning race in 2008 was a big one, the New York Turf Writers Handicap (NSA G1) at Saratoga, and also finished a close second in the A. P. Smithwick Memorial (NSA G2) at Saratoga. Winner of seven of fourteen starts, she broke her maiden for $25,000 in May by fifteen lengths, then went on to win three starter allowance races, and three open allowance races, finishing with earnings of $223,520. Won the Vincent A. Moscarelli Memorial at Delaware Park, and both the Fall Highweight Handicap and the Gravesend Handicap (G3) at Aqueduct, and fifth in the Breeders’ Cup Sprint (G1), earning $306,580. AUGUSTIN STABLE – GEORGE STRAWBRIDGE, JR.
Total earnings of $1,362,734 in North America and Europe for horses bred by George Strawbridge Jr.